Alexandra Lange: Concrete utopia: What does our love of brutalist buildings say about us? Concrete utopia: What does our love of brutalist buildings say about us? Miodrag Zivkovic. Monument to the Battle of the Sutjeska. 1965-71. Photo by Valentin Jeck, courtesy Museum of Modern Art. First on Tumblr, then on Instagram: frame-filling, deep-shadowed, looming edifices, gray and often looking perpetually damp, pocked by windows, frilled with balconies, enlivened by murals or supergraphics or plants. But popularity breeds restlessness. Paul Rudolph’s bush-hammered walls? Been there. The Barbican? Done that. Boston City Hall? A thousand op-eds. Flaine? Boutique ski resort. Marina City? Album cover. The eye needs to travel. So social media gave us more: bigger buildings, more flamboyant and flowing forms, more spectacular settings. 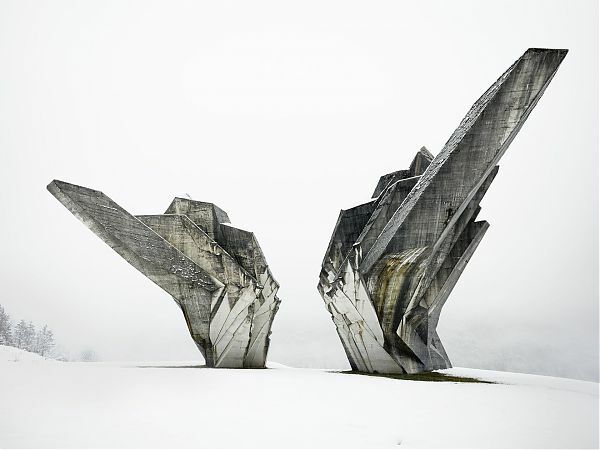 Like Yugoslavia: first through the photographs of Jan Kempenaers, widely published in 2013, then through Instagram accounts like _di_ma and socialistmodernism for a daily dose of concrete. It was as if a forest of concrete mushrooms had sprouted and grown to gargantuan size while we were otherwise occupied.